Often seen in the emergency department, nasal foreign bodies (NFBs) are most often a pediatric phenomenon. However, adults, particularly those with mental retardation or psychiatric illness, can also fall victim. NFBs can cause mucosal damage and, if they dislodge into the airway, can even prove fatal. [1, 2] See the image below. 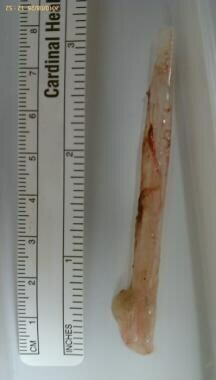 8-cm straw removed from patient's right nasal cavity. She had a history of placing objects in her nose to help relieve acute sinusitis symptoms. She was seen several years previous to this procedure for removal of a similar straw after similar sinus symptoms. Image courtesy of Philip Zapanta, MD. The most common locations for NFBs to lodge are just anterior to the middle turbinate or below the inferior turbinate (see the illustration below). Unilateral foreign bodies affect the right side about twice as often as the left. This may be due to a preference of right-handed individuals to insert objects into their right naris. 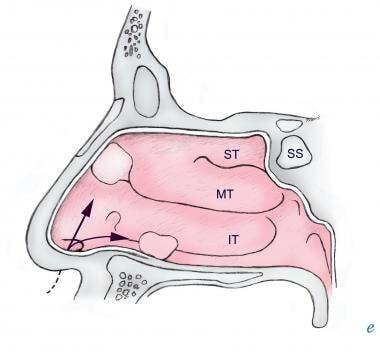 Common sites of impaction of foreign bodies in the nasal cavity (IT = inferior turbinate; MT = middle turbinate; SS = sphenoid sinus; ST = superior turbinate). Some studies have demonstrated a greater prevalence of NFBs in males than in females (ie, 58% males  ); however, this trend has not been universal. Among children, those aged 2-5 years have the highest incidence of NFBs. Children develop their pincer grip at about age 9 months; in theory, this is necessary for most cases of NFB insertion. For patient education information, see the Ear, Nose and Throat Center, as well as Foreign Body in the Nose. 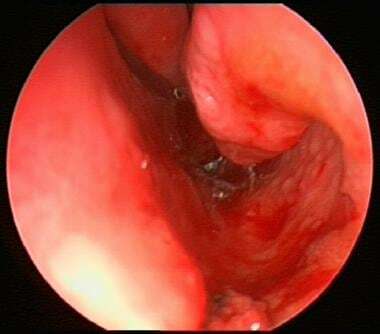 Bleeding is the most common complication reported in patients with nasal foreign bodies (NFBs), although it is characteristically minimal and resolves with simple pressure. Local inflammation from NFBs can result in pressure necrosis. This, in turn, can cause mucosal ulceration and erosion into blood vessels, producing epistaxis. The swelling can cause obstruction to sinus drainage and lead to a secondary sinusitis. Organic foreign bodies tend to swell and are usually more symptomatic than are inorganic foreign bodies. Foreign body is shown in the left nasal cavity with surrounding inflammation. Image courtesy of Brian Reilly, MD. View of the nasal cavity after removal of the foreign body. Note the rust from screw. Image courtesy of Brian Reilly, MD. Foreign body was removed in its entirety. Image courtesy of Brian Reilly, MD. No additional foreign body noted on completion of nasal endoscopy. There can always be additional foreign bodies, so it is imperative to take a "second look" after initial removal. Image courtesy of Brian Reilly, MD. Firmly impacted and unrecognized foreign bodies can in time become coated with calcium, magnesium, phosphate, or carbonate and become a rhinolith. Rhinoliths are radio-opaque and typically are found on the floor of the nasal cavity. Rhinoliths can remain undetected for years and only upon growth produce symptoms that lead to their discovery. NFBs tend to go unrecognized for longer periods of time than do foreign bodies in the ear because they usually produce fewer symptoms and are more difficult to visualize. Metallic button batteries are small and shiny and are found in many toys, making them strong candidates for NFB insertion. Once inserted into the nose, they cause destruction via low-voltage electrical currents, electrolysis-induced release of sodium hydroxide and chlorine gas, and even liquefactive necrosis if their alkaline contents leak out. 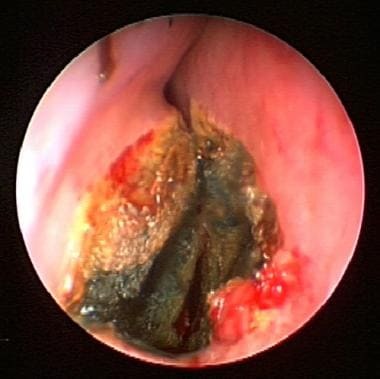 Button battery in the right floor of nose causing electrical burn with necrosis of the inferior turbinate and septum. Image courtesy of Brian Reilly, MD. Close-up of necrosis. Image courtesy of Brian Reilly, MD. Larvae and worms have been known to occasionally inhabit the nasal cavities of persons living in tropical and unhygienic environments. They can lead to the destruction of the nasal mucosa and subsequent necrosis of septal cartilage and turbinates. Some authors have even reported extension to the orbit and paranasal sinuses. Because of the invasive nature of these NFBs, treatment typically consists of instillation of an agent to kill the larvae or worm, followed by surgical debridement and antibiotic therapy. These cases should be managed in conjunction with a specialist. In most cases, the insertion of the nasal foreign body (NFB) is witnessed, and the dilemma of diagnosis is eliminated. In one study, presentations over 48 hours after the time of insertion accounted for 14% of all cases. In addition to obtaining a thorough history from the patient and his or her primary guardian(s), all caretakers who have recently spent time with the patient (eg, babysitters) must be interviewed. Once the diagnosis is missed, the foreign body may not be detected for days, weeks, or even years. Among the delayed presentations, the most common clinical scenario is unilateral nasal discharge. Nevertheless, clinicians must entertain the diagnosis of NFB in all patients with nasal irritation, epistaxis, sneezing, snoring, sinusitis, stridor, wheezing, or fever. Some authors have even reported discovering NFBs as the etiology of more unusual patient presentations, such as irritability, halitosis (unpleasant breath odor), or generalized bromhidrosis (body malodor). To avoid complications and delayed treatment, clinicians must maintain a high index of suspicion for this diagnosis. The patient may present asymptomatically after having been witnessed inserting the item. Alternatively, the patient may have unilateral nasal drainage, foul odor, sneezing, epistaxis, or pain. Patients often deny having placed the foreign body; if the diagnosis is considered, this history should not lower the practitioner’s suspicion. The physical examination is the main diagnostic tool, and a cooperative patient is essential for success. Parents and staff may be needed to comfort and immobilize a child to allow for a thorough otorhinolaryngologic examination. Sedation is often helpful in the pediatric population. Maximal visualization of the nasal cavity is obtained by wearing a headlamp. Some authors recommend positioning children younger than age 5 years in a supine lying position and older children in a sitting "sniffing" position to allow optimal visualization. A nasal speculum may also help to view the nasal cavity, although some authors report less patient anxiety and equally good visualization by using one's thumb to pull the nose upward. The object can be found in any area of the nasal cavity, though objects are most predictably below the inferior turbinate or immediately anterior to the middle turbinate. Occasionally, evidence of local trauma may exist, with erythema, edema, bleeding, or a combination thereof. After prolonged exposure, an increase in these findings is likely to be observed, as well as the presence of nasal discharge and a foul odor. In addition to adequate inspection of the nasal cavity, assessing for complications of the nasal foreign body is important. Visualize the tympanic membranes for signs of acute otitis media, assess for sinusitis, check for nuchal rigidity in the toxic child, and auscultate the chest and neck for wheezing or stridor, which may be a clue of foreign body aspiration. If there is a question of ingestion or aspiration of a foreign body, the patient should be evaluated with chest/abdominal radiography. An aspirated, radiolucent foreign body may be inferred by postobstructive air trapping, and an ingested foreign body will show up if it is radiopaque, as most ingested foreign bodies are. 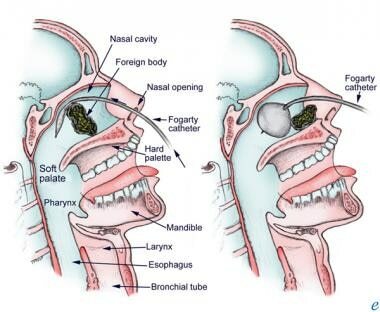 Nasal foreign body removal may be attempted by an experienced clinician if the object can likely be extracted. 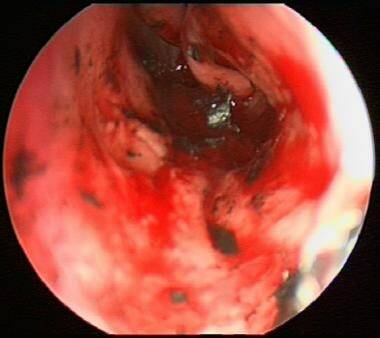 If doubt exists about the reasonable probability of extraction, an otolaryngologist should be consulted. Repeated attempts at removal may result in increased trauma and potential movement of the item into a less favorable location. Mechanical removal of a foreign body should not be attempted if the item appears to be out of range for instrumentation. Removal should not be performed without adequate sedation in an uncooperative patient whose head cannot be securely and safely stabilized. Ideally, nonmechanical techniques such as positive air pressure should instead be attempted in these patients. Local anesthesia is typically not necessary, as pain is most often not present nor inflicted upon patients during removal. However, pharmacologic vasoconstriction of the nasal mucosa can facilitate examination and removal of an NFB and use of these agents should be strongly considered. Anesthesia and mucosal vasoconstriction can be accomplished by applying several drops of 1% lidocaine (without epinephrine) and 0.5% phenylephrine to the affected nostril. For the apprehensive patient, a nebulized solution of 1-2mL of 1:1000 epinephrine has been used successfully for mucosal vasoconstriction. Of note, the author of the nebulized epinephrine case report recommended its use only if the NFB is large enough that posterior movement is unlikely and if the practitioners are experts at securing airways. Proper positioning is vital in achieving optimal visualization and stability of the head. Patients may be placed in the “sniffing position,” either supine or with slight elevation of the head. Uncooperative patients in whom procedural sedation cannot be used must be securely immobilized. Even in a cooperative patient, assistance should be obtained to stabilize the head. Using a 0-degree rigid nasoendoscope, aspiration of the area of the right osteomeatal complex reveals a clear foreign body. Take note of the perforated septum on the right. The patient had a history of snorting cocaine, and cocaine use has been associated with perforated nasal septums. Video courtesy of Philip Zapanta, MD. All attempts at removal can be complicated by mucosal damage and bleeding. In addition, all failed attempts can result in posterior displacement of the NFB. This technique is ideal for easily visualized, nonspherical, nonfriable foreign bodies. Previously described instruments include hemostats, alligator forceps, and bayonet forceps (see the video below). Friable and spherical foreign bodies are particularly difficult to remove with this technique; friable objects may tear, and spherical objects may be difficult to grasp, resulting in posterior displacement. Straight alligator forceps are used to firmly grasp the nasal foreign body, a clear plastic straw. Subsequently, a complete endoscopic examination of the nose was performed to rule out a second nasal foreign body. This is very important in pediatric patients and in other select patients. Video courtesy of Philip Zapanta, MD. Interestingly, some authors have suggested using the combination of direct instrumentation to grasp an object while having a balloon catheter (see next paragraph) placed behind the object to prevent posterior displacement during removal attempts. This approach is ideal for small, round objects that are not easily grasped by direct instrumentation. Authors have used Foley catheters (eg, 5-8 French) or Fogarty catheters (eg, No. 6 biliary or No. 4 vascular), and the Katz Extractor Oto-Rhino Foreign Body Remover (InHealth Technologies, Calif) is also an option. The biliary Fogarty catheter has been preferred over the vascular Fogarty catheter by some authors because its balloon is firmer and theoretically less prone to rupture. Use of a Fogarty catheter to remove a nasal foreign body. Large, occlusive foreign bodies are especially amenable to the positive-pressure technique. Several techniques have been developed to expel NFBs by force provided in the form of positive pressure. The least invasive form, "forced exhalation," can be accomplished by occluding the unaffected nostril and asking the child to blow hard out of his or her nose. If this fails, the positive pressure can be applied by either the parent's mouth ("parent's kiss" [19, 20] ) or a bag-valve mask. If these techniques do not completely remove the object, they may at least dislodge the object more anteriorly and allow for removal using the previously described techniques. Another positive-pressure technique delivers air into the unaffected naris with the patient's mouth closed. In this method, the patient is placed on his or her side (foreign-body-side down), and the delivery device (known as a Beamsley Blaster) provides high-flow oxygen (10-15L/min) into the unaffected naris. To set up the Beamsley Blaster, one end of oxygen tubing is connected to the oxygen source and the other end is connected to a male-male oxygen tube adaptor that is placed in the patient's unaffected naris. Self-limited, subcutaneous, periorbital emphysema has been reported as a complication of NFB removal via intranasal positive pressure. 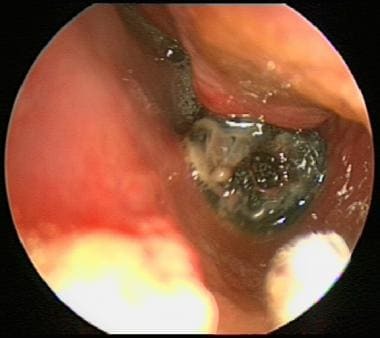 Positive-pressure techniques also have the risk of causing barotrauma to the airway, lungs, or the tympanic membranes, and clinicians should avoid using large volumes of forced air. To the best of our knowledge, these latter complications have not been reported. This technique is ideal for easily visualized, smooth or spherical foreign bodies. The catheter tip is placed against the object, and suction is applied at 100-140mm Hg (readily supplied by standard medical suction equipment). A strong seal is important for success of this technique, and authors have recommended using a Schunk neck suction catheter with its plastic umbrella tip or a Frazier suction catheter with a segment of pliable tubing connected to its tip for a strong seal with the foreign body. This method is ideal for easily visualized smooth or spherical foreign bodies that are dry and nonfriable. A thin coat of cyanoacrylate adhesive is placed on the tip of a wooden or plastic applicator, which is then pressed against the foreign body for 60 seconds and removed. Without full cooperation of the patient, the nasal mucosa can be easily injured by misplaced glue. Rarely, a foreign body may be so posterior that the above techniques will not work. In these cases, after consultation with a specialist, it may be necessary to induce further posterior displacement of the object into the oropharynx for removal. Of course, this requires general anesthesia, endotracheal intubation, and esophageal occlusion. A case report demonstrated successful removal of a loose ball bearing from a nasal cavity using a household magnet. The authors believe that a strong magnet may be especially useful to remove button batteries, which are associated with mucosal edema and significant bleeding with direct instrumentation, making visualization especially difficult. This technique has been strongly criticized for carrying a significant risk of aspiration or choking. The authors do not recommend the use of this method; however, it will be reviewed so that clinicians can be aware of its existence. The irrigation technique is performed by forceful squeezing of a bulb syringe filled with 7mL of normal saline into the unaffected naris. In general, nasal foreign bodies (NFBs) can be safely removed by emergency physicians. 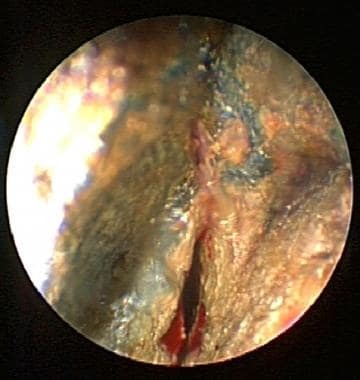 However, an otolaryngologic specialist should be promptly consulted for cases of failed removal or an NFB complicated by significant damage to adjacent structures. A nonemergent referral to a specialist should be made when there is concern that a tumor or mass is present. Contact a specialist when a tumor or mass is suspected to avoid delayed diagnosis of a malignancy. Consult a specialist when managing an NFB complicated by significant damage to the nasopharynx (eg, button battery content leakage). Gupta R, Nyakunu RP, Kippax JR. Is the emergency department management of ENT foreign bodies successful? A tertiary care hospital experience in Australia. Ear Nose Throat J. 2016 Mar. 95 (3):113-6. [Medline]. Patil PM, Anand R. Nasal foreign bodies: a review of management strategies and a clinical scenario presentation. Craniomaxillofac Trauma Reconstr. 2011 Mar. 4 (1):53-8. [Medline]. [Full Text]. Kiger JR, Brenkert TE, Losek JD. Nasal foreign body removal in children. Pediatr Emerg Care. 2008 Nov. 24(11):785-92; quiz 790-2. [Medline]. Svider PF, Sheyn A, Folbe E, et al. How did that get there? A population-based analysis of nasal foreign bodies. Int Forum Allergy Rhinol. 2014 Nov. 4 (11):944-9. [Medline]. Srinivas Moorthy PN, Srivalli M, Rau GV, Prasanth C. Study on clinical presentation of ear and nose foreign bodies. Indian J Otolaryngol Head Neck Surg. 2012 Mar. 64(1):31-5. [Medline]. [Full Text]. Scholes MA, Jensen EL. Presentation and management of nasal foreign bodies at a tertiary children's hospital in an American metro area. Int J Pediatr Otorhinolaryngol. 2016 Sep. 88:190-3. [Medline]. Hills RW, Brown JC, Brownstein D. Barotrauma: a complication of positive pressure for nasal foreign body removal in a pediatric patient. Ann Emerg Med. 2008 Dec. 52(6):623-5. [Medline]. McRae D, Premachandra DJ, Gatland DJ. Button batteries in the ear, nose and cervical esophagus: a destructive foreign body. J Otolaryngol. 1989 Oct. 18(6):317-9. [Medline]. Bakshi SS, Coumare VN, Priya M, Kumar S. Long-Term Complications of Button Batteries in the Nose. J Emerg Med. 2016 Mar. 50 (3):485-7. [Medline]. Mishra P, Bhakta P, Kumar S, Al Abri R, Burad J. Sudden near-fatal tracheal aspiration of an undiagnosed nasal foreign body in a small child. Emerg Med Australas. 2011 Dec. 23(6):776-8. [Medline]. Hong D, Chu YF, Tong KM, Hsiao CJ. Button batteries as foreign bodies in the nasal cavities. Int J Pediatr Otorhinolaryngol. 1987 Nov. 14(1):15-9. [Medline]. Yeh B, Roberson JR. Nasal magnetic foreign body: a sticky topic. J Emerg Med. 2012 Aug. 43(2):319-21. [Medline]. DeWeese DD, Saunders AH. Acute and chronic diseases of the nose. DeWeese DD, Saunders AH. Textbook of Otolaryngology. St. Louis: Mosby; 1982. Oh H, Min HJ, Yang HS, Kim KS. Is Radiologic Evaluation Necessary to Find out Foreign Bodies in Nasal Cavity?. J Craniofac Surg. 2016 Jan. 27 (1):e62-4. [Medline]. Tong MC, Ying SY, van Hasselt CA. Nasal foreign bodies in children. Int J Pediatr Otorhinolaryngol. 1996 May. 35(3):207-11. [Medline]. Kadish HA, Corneli HM. Removal of nasal foreign bodies in the pediatric population. Am J Emerg Med. 1997 Jan. 15(1):54-6. [Medline]. Fundakowski CE, Moon S, Torres L. The snare technique: a novel atraumatic method for the removal of difficult nasal foreign bodies. J Emerg Med. 2013 Jan. 44(1):104-6. [Medline]. Brown L, Denmark TK, Wittlake WA, Vargas EJ, Watson T, Crabb JW. Procedural sedation use in the ED: management of pediatric ear and nose foreign bodies. Am J Emerg Med. 2004 Jul. 22(4):310-4. [Medline]. McMaster WC. Removal of foreign body from the nose. JAMA. 1970 Sep 14. 213(11):1905. [Medline]. Giourgos G, Matti E, Pagella F. Endoscopic removal of a nasal foreign body with the "hook-scope" technique. Eur Arch Otorhinolaryngol. 2009 Oct. 266(10):1663-5. [Medline]. Francois M, Hamrioui R, Narcy P. Nasal foreign bodies in children. Eur Arch Otorhinolaryngol. 1998. 255(3):132-4. [Medline]. Botma M, Bader R, Kubba H. A parent's kiss': evaluating an unusual method for removing nasal foreign bodies in children. J Laryngol Otol. 2000 Aug. 114(8):598-600. [Medline]. Heim SW, Maughan KL. Foreign bodies in the ear, nose, and throat. Am Fam Physician. 2007 Oct 15. 76(8):1185-9. [Medline]. 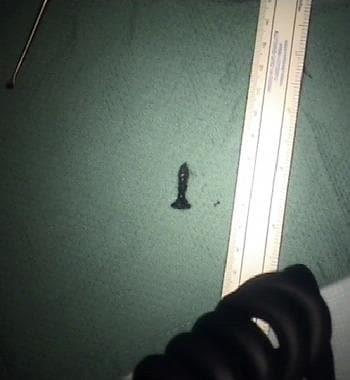 A button battery was removed from a child who presented with unilateral nasal discharge. The battery contents were intact. Button battery foreign body after removal from nasal cavity. Image courtesy of Brian Reilly, MD. The authors and editors gratefully acknowledge the assistance of Lars Grimm with the literature review and referencing for this article. Medscape Drugs & Diseases thanks Brian Kip Reilly, MD, Assistant Professor of Otolaryngology and Pediatrics, Department of Otolaryngology, Children's National Medical Center, George Washington University School of Medicine, for many of the images in this article. Medscape Drugs & Diseases thanks Philip E Zapanta, MD, Assistant Professor of Surgery, Associate Director of Otolaryngology Residency Program, Division of Otolaryngology-Head and Neck Surgery, George Washington University Medical Center; Consulting Staff, Division of Otolaryngology-Head and Neck Surgery, Medical Faculty Associates, for the videos and one of the foreign-body images in this article.